(CNSNews.com) - The number of fans who attended games featuring NCAA Football Bowl Subdivision (FBS) teams this weekend was nearly 4 times the number attending NFL games. The total number of attending FBS college games, according to attendance numbers published by ESPN, was 3,513,235. The total number attending NFL games was 931,721. 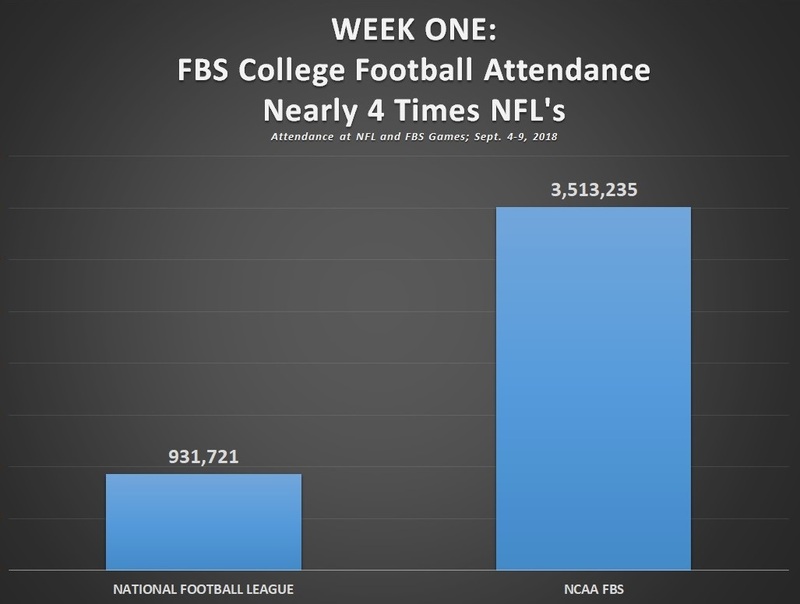 That means there were 3.77 times as many fans--in the stands--personally watching FBS college games this weekend than there were fans in the stands watching NFL games. FBS college football teams played 78 games this past weekend while NFL teams played 14--with two NFL games remaining to be played on Monday night (the New York Jets vs. the Detroit Lions and the Los Angeles Rams vs. the Oakland Raiders). Overall, there are 130 NCAA FBS teams, while there are only 32 NFL teams. This past weekend, several FBS college teams played nonconference games against opponents who are not FBS teams but are in the NCAA's Football Championship Subdivision. The total attendance numbers for all FBS games were found in box scores on ESPN.com with 1 exception. (The attendance for the Tulsa vs. Texas game was found on the Texas Longhorns Athletics website). ESPN.com also published attendance numbers for all NFL games this weekend.